After qualifying as an osteopath Simon embarked on a clinical and academic career. He lectured in physiology and osteopathic medicine at undergraduate and postgraduate level both in the UK and internationally. Simon was for many years a faculty member and osteopathic vice-principal of European School of Osteopathy. He has served the education committee of the American Academy of Osteopathy and has been an external MSc examiner at University of Westminster. Simon devoted much of his professional life to securing the recognition of osteopathy as an independent primary contact healthcare profession and this culminated in the passing of the Osteopaths Act in 1993. He was appointed by ministers as the first chair of the General Osteopathic Council responsible for bringing the Osteopaths Act into force. He also spent 11 years as a Special Advisor at the Department of Health and was a founder member of the RCGP Commission on primary care. He is currently vice-chair of the board of trustees of The College of Medicine a charity he helped establish and for many years served on the editorial boards of the journals of Inter-professional Care and Holistic Healthcare. In addition Simon has many other charitable interests and served as a long term trustee on the boards of The Prince of Wales’s Foundation for Integrated Health, Demelza House Children’s Hospice, the Osteopathic Education Foundation, the Spinal Foundation, the International Osteopathic Alliance and was the founder chair of the Council for Anthroposophical Health and Social Care. Simon has been involved with Crossfields Institute from the beginning as a founder trustee and now chairs the Board. He is also a founder trustee of the Kairos Rehabilitation Trust which assists patients suffering from complex long-term conditions. Shaina Stoehr has been active in the field of adult education for the past 30 years. Her specialisation is in the expressive movement art of eurythmy, with a BA in Art and Education (Empire State College, NY 1980) and an MA in Education and Eurythmy (Plymouth University 2011). She currently supervises eurythmy trainings in St. Petersburg, Russia and Boulder, Colorado. She is on the faculty of Alanus Hochschule in Germany, running an MA program delivered in English and teaches regularly at the Norwegian Eurythmy School in Oslo. She sits on the advisory board of the Section for Performing Arts, and on the Council of Eurythmy Therapy Trainings at the Goetheanum, Dornach, Switzerland. In addition to her activity in the field of adult education, Shaina has worked as a therapist in clinics, special needs colleges, and in private practice. Her recent research work has focused on the benefits of eurythmy therapy for young people with Asperger’s and autistic spectrum disorder. She co-directs the Eurythmy Therapy Training in Great Britain, an international post-graduate course, training eurythmists in the application of eurythmy within the medical field. Shaina has been active in Crossfields Institute from its inception, serving on the board of trustees since 2007. Lesley Moore RN, Dip. in Nursing (Wales), Cert. Ed. (FE), MA in Social Ethics, D.Phil. Lesley has recently retired as an Associate Professor in Work-based Learning from the University of the West of England, Bristol. As a nurse Lesley worked in both the NHS and military sectors and became a nurse teacher in 1986. During her time as a nurse academic Lesley was committed to the vision of lifelong learning and the development of professional and collaborative practice, and inter-professional learning. The latter was developed further through leading cross-university projects on work-based learning, and a Florence Nightingale Scholarship (2000) where she explored ethical reasoning workshops in a Dutch hospital. The award of a National Teaching Fellowship and a Churchill Fellowship in 2005 enabled Lesley to explore ways of enabling professional health care staff to communicate with people with learning disabilities (University of Kentucky), and an innovative inter-professional, healthcare undergraduate programme (Northeastern University, Boston USA). As Director of Work-based Learning Lesley worked closely with HE colleagues in all faculties and the FE sector to validate specific programmes from Certificate to Masters levels. Lesley is skilled at developing action focused distance learning materials, working with blended learning and facilitating adult learning approaches. Currently Lesley is an external examiner for work-based learning at the University of Chester. Previous examining roles have been on professional courses at Westminster University and Napier University (Edinburgh). Since retirement Lesley is engaged with voluntary work such as the Trustee role for Crossfields, and a community governor role for an Academy and 6th form, case worker for Soldier, Sailors, Airmen and Families Association (SSAFA), and a mentor for new Churchill Fellows. 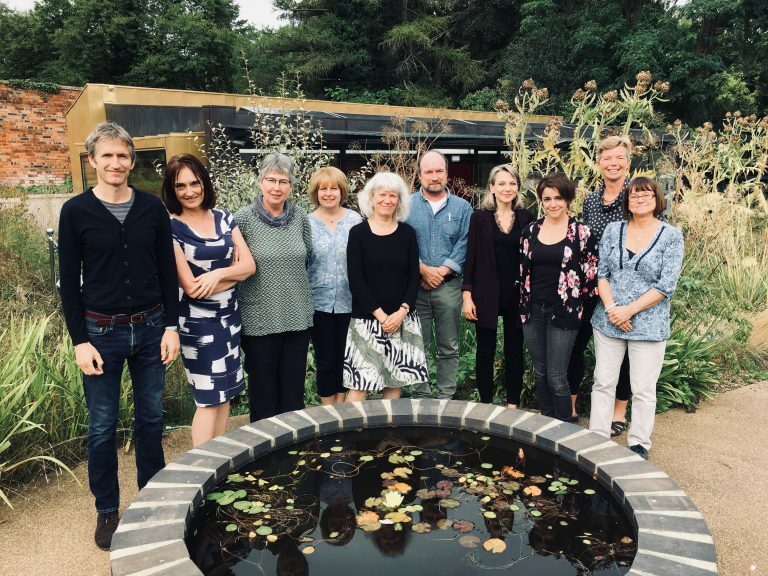 From the inception of Crossfields Institute in 2007, Charlotte has worked with its growing teams to promote and develop collaborative educational action research, involving local, national and international partner organisations and stakeholders. She has also recently founded Crossfields Europa, based in Denmark, which is the consultancy arm of Crossfields Institute and of which she is the Director. Since moving from Denmark to the UK in 1999, Charlotte worked within the UK further and higher education sector where she specialised in qualifications development, quality assurance systems and accreditation solutions. As a Quality Assurance and Accreditation Officer, Educational Consultant and University Administrator, she specialised in UK and EU regulations and standards for further and higher education. Before graduating with a Masters of Education (RSUC, grad. 2012), Charlotte studied Leadership and Management (EPOC, grad. 2008), Philosophy of Mind (OU, grad. 2004) as well as Foundation Studies in Counselling and Psychotherapy (BCPC, grad. 2001). She is currently working towards a PhD in Educational Leadership in the Department for Business and Law at University of the West of England. In the last eight years, Charlotte has dedicated her charitable work to supporting environmental and social innovation. She is a trustee of the Sunfield Children’s Home and her trusteeships since 2008 have included the Living Earth Land Trust (charity no. 1139874), the Biodynamic Association (charity no. 269036) and Shire Training Workshops Limited (charity no. 285834). Charlotte is also a founding member of the Biodynamic Association Board of Studies. Cécile moved to the UK from France in 1994 and spent 15 years in London working in a corporate environment (private equity, investment banking) before moving to Gloucestershire in 2009. She joined Crossfields Institute in 2011 as PA to the Director and now heads the Executive Office and the Academic Administration department. She is also Deputy Director of Crossfields Europa, the consultancy branch of Crossfields Institute, based in Denmark. She holds a degree (DEUG) in History from the Université de Pau et des Pays de l’Adour (France) and a BA Honours in English from the Université Michel de Montaigne – Bordeaux III (France) as well as a Diploma in Translation (French/English) from the University of Westminster. She is currently studying towards an MA in Music. Marcus joined Crossfields Institute in November 2013 and is responsible for the maintenance of the Crossfields Institute website and Virtual Learning Environment. Marcus holds an Advanced GNVQ in IT and Diploma in Web Design. Before joining the Institute, he worked for the Library Service, where his responsibilities included customer service and IT support to users. Marcus’s main strengths include helping users with their use of the Virtual Learning Environment, creating clear step-by-step user guides, and solving technical issues. He has also successfully created and redesigned Virtual Learning Environments for several institutions. Judy joined the Quality Team at Crossfields Institute in October 2010, after more than 10 years in the corporate sector where she was the Quality Manager at Orange Telecommunications Ltd. In her 7 years at Crossfields Institute she has learned a great deal about the education sector, working as Deputy to the Founder from 2014, in January 2018 she came Chief Executive Officer and has executive responsibility for the Crossfields Institute Group. Alison is the Head of Quality and Responsible Officer at Crossfields Institute. She joined the Quality team in 2011 after more than 20 years working in the adult and community education sector. Prior to joining Crossfields Institute, she worked in Adult Education Quality Assurance for the local authority and was involved in local authority internal and inter-authority inspections, reviews and staff and organisational development. In the mid-1990s Alison trained and qualified as a person-centred counsellor (DipCouns). More recently she has been a teacher educator, staff development officer and qualified assessor, lead internal quality assurer and lead external quality assurer. She gained Qualified Teacher Learning and Skills (QTLS) through Professional Recognition. Alison is a Member of the Society for Education and Training (MSET), the professional membership association for those working in post-16 education and training. As Head of Quality and Responsible Officer, she oversees the management of the Awarding Organisation part of Crossfields Institute, which includes the Qualification Development, Quality Team and Academic Administration registration and certification function. Debbie qualified with a BEd from Bath University and has worked in education and training for over 35 years. She has an MBA, specialising in strategic management and managing organisational change. She joined the Quality team of Crossfields institute in 2013. Since then, she has qualified as an External Quality Assurer. She travels extensively, visiting and monitoring Crossfields Institute centres. Isis Brook is Head of Faculty at Crossfields Institute International. She held philosophy lectureships at Lancaster University, where she also served as a Faculty Teaching Dean, and the University of Central Lancashire. The main areas of philosophy that she taught were: aesthetics, environmental ethics, and phenomenology. She completed a PhD on Goethean science in 1994 and continues to research and publish on our relationship to nature and to the world. Isis also has a Masters in Education and pursues an active interest in education of the whole person and a specialism in assessment. In her last position, Isis was Head of Learning and Teaching at Writtle College. Her work at Writtle College included staff development, curriculum design, and strategic leadership on learning and teaching, as well as chairing committees and award boards. Louise joined Crossfields in September 2014 as Qualification Development Coordinator. She has a rich employment history, working in both public and private sectors, and brings this experience with her as she works alongside our centres, learners and partner organisations. Louise has a BSc in Economics, a Post Graduate Diploma in Management and holds Qualified Teacher Status. In joining Crossfields she is embracing the opportunity to deepen her understanding of holistic and integrative approaches at all levels and to further develop her educational philosophy. From November 2017 she is now Head of Qualification Development. Jane is responsible for the administration of Crossfields International faculties. She is working with the Faculty for Environment and Transdisciplinary Studies in developing and promoting a new course, Master of Science in Researching Holistic Approaches to Agroecology and is heavily involved in the planning and coordination of faculty for the Masters of Science in Practical Skills Therapeutic Education (Integrated Professional Development), accredited by the University of the West of England and co-developed with Ruskin Mill Trust. She has worked in an administrative capacity in education for the last 20 years, 9 of which she served within the Ruskin Mill Trust adult education departments. Prior to that, Jane was a school administrator for over a decade and she also worked for Dun and Bradstreet, where she was responsible for organising events ranging from small UK seminars through to large conferences in various European locations for upwards of 500 people. Jane is also involved in the Academic Administration team, where she oversees the registration and certification of students, using the online centre management platform Mercury. Jonathan is Director of Crossfields Institute International (CII), a lecturer on CII’s HE programmes and a workshop leader on a range of CII short courses. Jonathan is currently co-lead and a module leader for the Researching Holistic Agroecology pathway of the MA in Philosophy of Social Innovation (an Alanus University programme). Jonathan has a deep interest in consciousness studies, the western esoteric tradition, holistic and natural sciences, gardening, and education. These interests informed both his Bachelor’s degree (Integral Studies, CIIS, California), and his M. Ed (Social and Environmental Education, RSUC Oslo). Jonathan is currently enrolled as a doctoral student with the University of Bath, focussing on educational research. Jonathan’s book Muck and Mind; Encountering Biodynamic Agriculture is distributed by Lindisfarne/Floris books. Fergus is part of the Crossfields International core faculty team. He is currently programme co-lead on the Philosophy and Practice of Integrative Education post-graduate certificate. HE also teaches and mentors on other CI courses. He is currently developing and piloting a consciousness studies module that is designed to combine with some of the other Crossfields Institute post-graduate level courses. He has recently completed a philosophy PhD on the experience of thinking, drawing on recent developments in philosophy of mind as well as his own research. This ties in with his long term interest in consciousness, first-person research and meditation. Fergus is also involved in developing and coordinating the Crossfields Institute research activities, including organising regular collaborative research conferences with partner institutions (see the research page on this site).